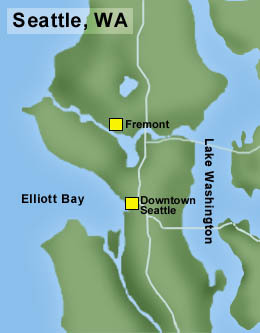 Fremont is easily reached from downtown Seattle by traveling along the west shore of Lake Union. Fremont in Seattle was one of the city’s early neighborhoods with its own identity. It was founded as a land development, like a suburb, with the name of Fremont given because its investors came from Fremont, Nebraska. In 1888 Edward and Carrie Blewett of Fremont, Nebraska, formed a business partnership with Seattle investors to develop the site. The new Fremont was in a very advantageous location. Despite the lack of roads between downtown Seattle to Fremont in 1888, people were already traveling across Lake Union by boat. The co-investors of Fremont intended to make it even more accessible from downtown Seattle via a streetcar line along the west side of Lake Union (Westlake Avenue). Information about buildings in Seattle’s historic neighborhoods can be found on the Seattle Department of Neighborhoods Historic Preservation page. There is a database of properties by address, or you can put in the neighborhood name such as Fremont, and see all of the buildings which have been “surveyed” (reviewed for architectural and historic info). The Fremont Bridge marks entry to the neighborhood known as the Center of the Universe. The historic settlement and development of the community of Fremont can be largely attributed to its advantageous geographic location. This setting almost directly north of the original Seattle townsite along the heavily wooded northwest shore of Lake Union was also connected to Salmon Bay and Puget Sound to the west by way of a slough or narrow stream – known as “the Outlet” – making it a convenient and accessible site for early Euro-American settlement and industries dependent on water-borne transportation. 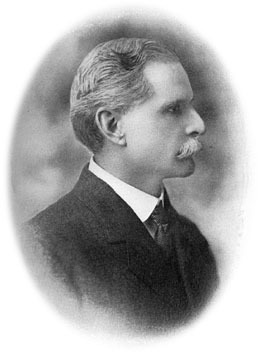 Edward C. Kilbourne was vitally involved in early development in Seattle, including streetcar lines. One of the local investors who assisted in the development of Fremont was Edward C. Kilbourne, who was also a major developer of electric street car lines. He favored Fremont in the extension of the streetcar route so that he could advertise house lots for sale in Fremont with the advantage of transportation to the site. In the 1880s some people would paddle a canoe across Lake Union to get to Fremont and other communities on the north shore of the lake. Kilbourne had that route covered, as well, as he was the owner of a twelve-passenger steamer, the Maude Foster, which carried people back and forth across Lake Union. Beginning in 1889 Kilbourne’s streetcar line ran from downtown Seattle up Westlake Avenue to Fremont. At Fremont there was a transfer point, now marked by the Waiting for the Interurban statue, to continue travelling northward to Green Lake or to Guy Phinney’s zoo (Woodland Park Zoo). The Waiting for the Interurban statue is at the corner of Fremont Avenue and North 34th Street just north of the Fremont Bridge. The statue commemorates the transfer point of streetcar and rail lines. In addition to the streetcar lines established in the 1880s-1890s, in 1910 the Interurban Railroad went northward through this same transfer point in Fremont, on its way to Everett. This was how the Fremont neighborhood became known as the Center of the Universe: you had to go there first before you could go anywhere else. For more on the Fremont neighborhood, see the Fremont category on this blog. I have written articles about the first homestead claim of the land by William A. Strickler in 1854 and how the legal issues of Strickler’s estate prevented Fremont from being settled until 1888. Under the Fremont category you can find articles about how Fremont was named and its street names, and stories of early businesses. I learn a lot from you! I had no idea Woodland Park zoo had a previous name, and I love the idea of having to canoe to get somewhere. The earliest Seattleites took their cue from the Indians, who also canoed everywhere, because there were few roads and bicycles had not yet been invented! People living in communities on the north shore of Lake Union found that canoeing across was the best way to go. it makes perfect sense to me! Only bad time would be the heavy wind and wave days! I’ve flipped my share of canoes in my time!